Chinese property magnate Cheung Chung Kiu has agreed to buy London's distinctive "Cheesegrater" The Leadenhall Building for £1.15-billion. LONDON: Chinese property magnate Cheung Chung Kiu has agreed to buy London's distinctive "Cheesegrater" skyscraper for £1.15-billion, current owner British Land said Wednesday, as foreign buyers profit from sterling's slump. The magnate's CC Land will buy The Leadenhall Building, shaped like a cheesegrater, after reaching an agreement worth the equivalent of $1.23 billion or 1.35 billion euros with British Land and Oxford Properties, joint owners of the prestigious site. The 46-floor building, the tallest in the City of London business district, was completed 2014 and charges record-breaking rents of more than £100 per square foot for prime floors. Tenants include insurers Aon and MS Amlin and the building's architects, Rogers Stirk Harbour and Partners. The building's unusual nickname derives from its distinctive wedge shape -- a result of London's strict rules on protected sightlines. "This sale shows continued investor appetite for best in class, well-located property in London," said Tim Roberts, the head of offices and residential at British Land. 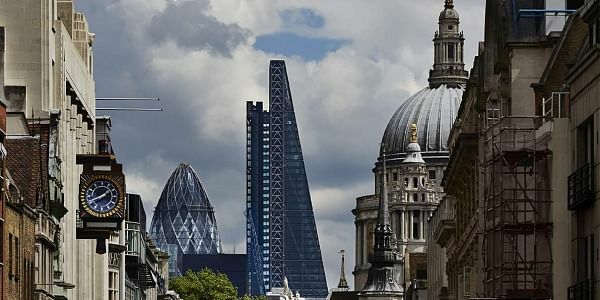 "British Land and Oxford Properties took a bold step at the early stages of the UK's economic recovery to develop The Leadenhall Building to generate a high-quality, long-term income stream. It's a decision which has really paid off," he added. Many of London's most famous office buildings are now under foreign ownership, with Qatar being a lead investor, buying the HSBC Tower in Canary Wharf for £1.2 billion in 2014. Britain's vote to leave the European Union last June sent sterling tumbling, pushing it around 14 percent lower against the Chinese yuan and making London property even more attractive. The Cheesegrater deal still needs to be approved by Hong Kong-based CC Land's shareholders.